Some of the best star-gazing in Europe can be experienced during stays in this tastefully-furnished bell tent in Limousin. 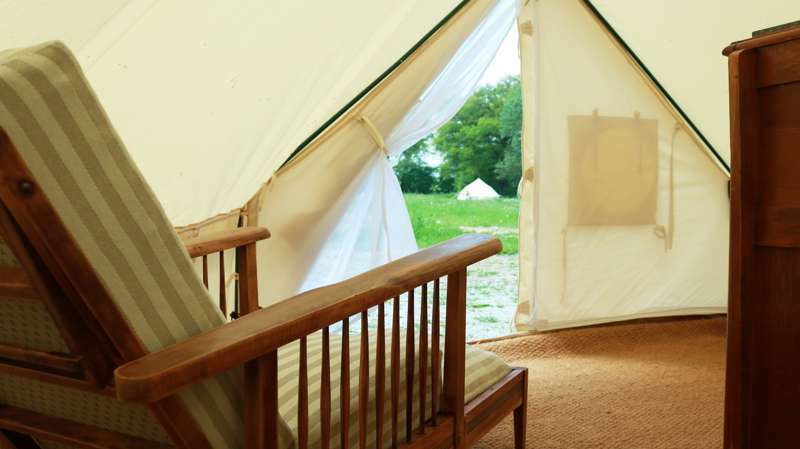 Estelle is a five-metre furnished bell tent. It is equipped with a double bed so is best suited to a couple but could also accommodate a cot. Eco friendly low energy LED lighting is available in each tent powered by a solar panel for convenience and candlepower for ambience. All our tents are situated on wooden bases and have comfortable outdoor furniture and you can choose to cooking on gas or an open fire: perhaps a gas ring for that morning cup of coffee and the Kadai Fire bowl for barbecues and toasting marshmallows! There are mains-powered fridges and charging points for each tent as well as a cool box inside the tents for the morning milk. A luxuriously-appointed shower room is exclusively yours for the duration of your stay. A ‘Guest Barn’ is kitted out for our guests’ use, and is fully-equipped to cater for up to 20 guests, complete with a range cooker adjacent to our original bread oven, in which we will cook you handmade pizzas. There's also a communal fire pit/barbecue area where everyone can get together for socialising and marshmallow roasting and a beautiful swimming pool surrounded by decking and more comfortable furniture.